Palazzo Odoni is a small establishment - not technically a hotel, though for convenience that's the easiest description - in the historic centre of Venice. 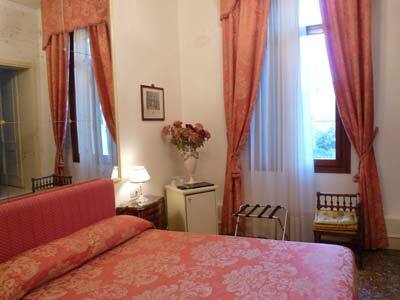 The accommodation is located in an attractive Gothic palace situated on a canal very near the bus and railway stations. As well as being atmospheric, the hotel is very convenient for travellers. In December 2009 I booked a double room online at short notice for €73. 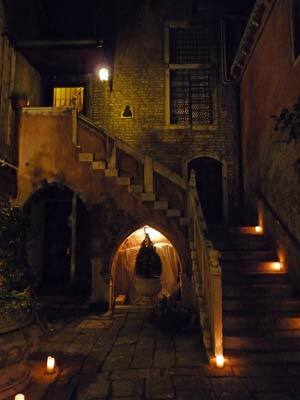 Palazzo Odoni's main entrance is a large doorway facing onto the canal; ring the doorbell to be buzzed in. Reception and accommodation is on an upper floor, and there's no lift, so you must be prepared to climb two flights of stairs. 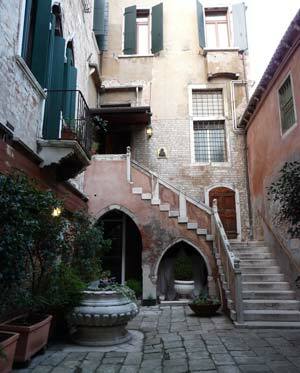 The first flight of steps is a traditional external staircase in a beautiful little courtyard; you really get the atmosphere of historic Venice here. Inside, up another flight of stairs, is the hotel's reception area, where I was greeted by a friendly receptionist at a low desk. There are two different accommodation businesses in the same building; the other is a 'residence' offering luxury apartments. I had booked the cheapest type of double room on offer, and was shown to a bedroom just around a corner from the reception area. The hotel has different categories of room, so I could have opted for a more spacious and expensive option. Although it wasn't large, my bedroom was high-ceilinged and elegant, with enough room to walk around the bed. The floor was traditional Venetian terrazzo (a hard but lightweight flooring made with marble chippings) which was slightly worn and very authentic in this historic palazzo setting. Furniture was simple, with only the bed and one small seat to sit on. There was a mini-bar, a suitcase stand, pretty antique bedside tables and a huge aged mirror over the bed. 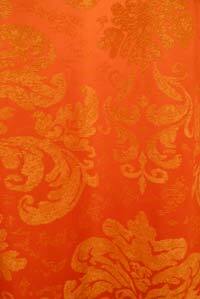 The style was traditionally Venetian, with cream and gold decor, Venetian and nautical prints on the wall and silk roses in a vase decorated with cherubs. The TV was small and positioned above the door. A small wardrobe with only three hangers contained a spare blanket and pillows. The hotel provided an information booklet about its services in English and Italian. The bathroom - which was up a step - was fairly small but very smart and new with a good shower. 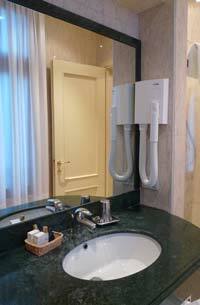 There were decent toiletries and a wall-mounted hair-drier. The only flaw I noted was that the bathroom got quite steamy. My bedroom had a tall window with a good view over gardens, other buildings, and church towers. For Venice, this was an unusually light and panoramic outlook. As the December weather was cold, I was pleased to find that the room was heated at a comfortable warm temperature. Breakfast was served in a small room decked out with Christmas decoration. There was a choice of leaf teas, fruit juice, cereals, dried, tinned and fresh fruit, cheese, ham and bread rolls. A typical Italian hotel breakfast, with the unusual feature of croissants carefully presented individually on plates. The public spaces in Palazzo Odoni were limited to the breakfast room and the lobby area. These areas, and the stairway, were all well-cared-for and were ornamented with Christmas decorations. The family running the hotel obviously took pride in their surroundings. I particularly liked the way the courtyard and stairway were illuminated with candles at night; returning to the hotel felt quite special. The staff I encountered were helpful and very smiley and friendly. The hotel's address is Santa Croce 151. Official addresses aren't very helpful in Venice; the important thing to know is that it is on Fondamenta Minotto, near Piazzale Roma, Venice's bus terminus. To get to Palazzo Odoni from Piazzale Roma: from the wide open bus depot area, cross through the line of trees and souvenir stalls to a a canalside. Head to the right to 'Tre Ponti,' an interlocking set of bridges. Cross the bridge over the large canal and follow the smaller canal which lies ahead, taking the covered canalside (called Fondamenta Zen). Cross the next bridge on your left and turn right along the canal. The hotel lies ahead on this side of the canal. From the railway station: turn left and cross the nearest bridge over the Grand Canal. Then turn right and walk along the canalside until you come to a small canal crossed by a little bridge. Don't cross the bridge; instead turn left down the small canal and follow it as it bends around, past the Church of the Tolentini. When you come to a 'canal T-junction', turn left and you'll find the hotel entrance further along this fondamenta (canalside). My understanding is that Palazzo Odoni isn't categorised as a hotel because of its size. It doesn't have the public spaces you might expect from a hotel, though it is fairly typical of places to stay in Italy. Unless you want the formality of a big international hotel, Palazzo Odoni is a very good and practical base for visiting Venice. My room wasn't extraordinary in any way, but it was decent and comfortable, and I was impressed with the small but smart bathroom. I think the biggest attractions of Palazzo Odoni are the wonderful historic building itself - even a Venetian friend was very impressed by the courtyard - and the location. The steps up to the entrance are a disadvantage if you're carrying luggage (ask for help if necessary) but the hotel has the huge advantage of being close to both Piazzale Roma and the railway station, meaning you won't have to drag your cases far, or over many bridges; a major consideration in pedestrian Venice. The hotel generally has good prices for online bookings, so it is an all-round practical solution. Palazzo Odoni is a good place to stay if you want to experience the high water phenomenon in Venice; some of the canalsides around the hotel are quite low-lying and prone to shallow flooding during exceptionally high tides. Unless you arrive at a very unlucky moment (in which case, just wait till the water subsides), this is more fascinating than inconvenient. The hotel's receptionist assured me that they keep a stock of wellington boots for guests. High water is rare; read about it here: Acqua alta. Review and photographs by Italy Heaven editor.